If your like me when it comes to researching into a topic, at first I have tones of motivation but when I start reading into a stupid amount of pages I start to get bored and then slowly but surely I become easily distracted. This is when one morning I thought this hopefully is the day I won’t become distracted and focus like a cat trying to catch a mouse. I came across this article: Picturebooks as Aesthetic Objects by Lawrence R. Sipe. This article is amazing if you want to analyse an image or painting in more detail. It is broken down into various sections, easily understandable and is put in simple terms with key words such as vignettes etc. Within colour there are hue, tone and saturation as well as tint and shade. Learning from this one section, I will be able to look into more depth when analysing the colours and suggesting why the illustrator has picked certain colours. Also how certain aspects such as a darker texture can effect the mood of the image. So definitely check this out if your doing anything with analysing an image specifically more a children’s picture book. If your not doing anything to do with this topic, it still is interesting as it makes you realise there’s more to a simple picture book than meets the eye. 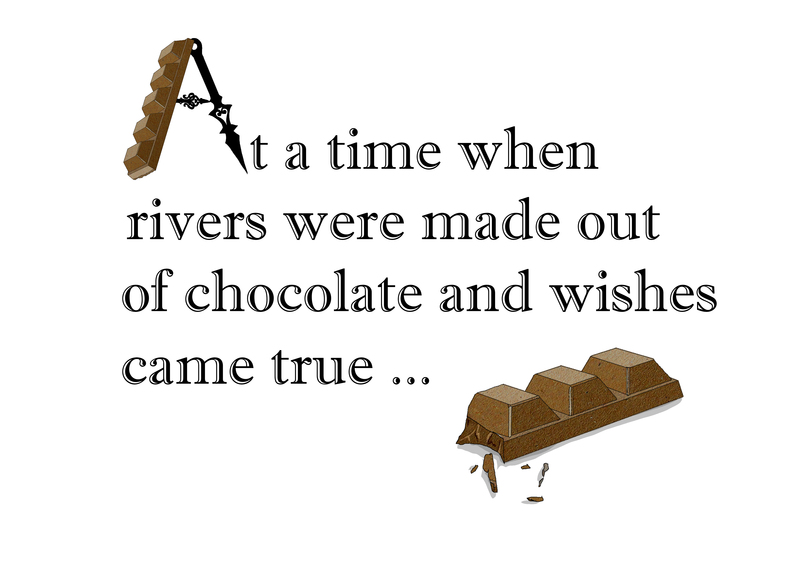 Update on my work: I have currently had a go at merging text with image with the beginning of a fairy tale story. Here are the two I had created taking inspiration from The True Story of the Three Little Pigs by Jon Scieszka, illustrated by Lane Smith (see above for the original inspiration from the book). Using key items in the text I have tried to incorporate them within the image without going over the top. 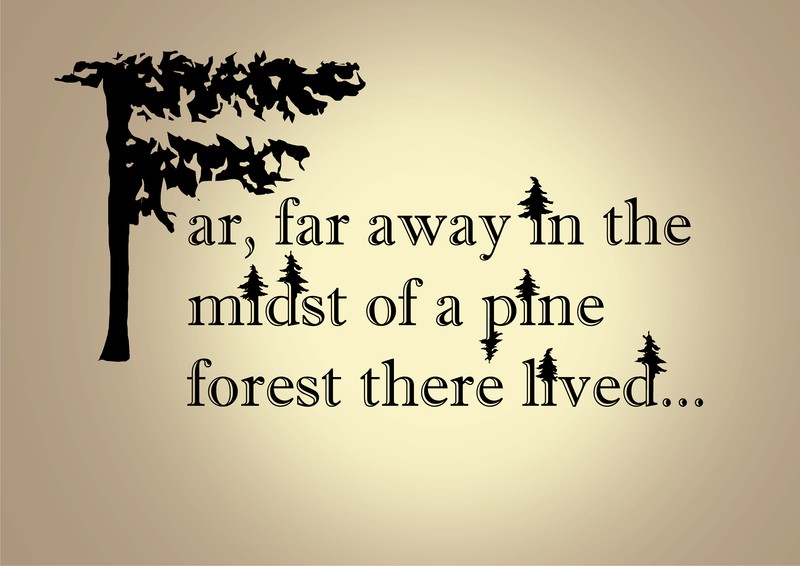 Looking at the pine image I am thinking maybe I should take out some of the trees within the text as there are one too many and over crowding the scene. The chocolate image, I am quite pleased with it although I would have liked to add another colour in to make it stand out e.g. the word river could be blue. I enjoyed creating these as I had put a time limit of and hour for each which I achieved. Thinking about next year where hopefully I will be able to create my own book I would like to incorporate this in the title page or something as I enjoyed the one in the three little pigs. I am slightly concerned with the amount of work I have been doing for this project, as most of my time is being spent trying to research into the dissertation as that is in for the beginning of December whereas this other project I have until January. Hopefully though I will be able to pull this project back up and get stuck in. Scieszka, J., Smith, L., 1991, The True Story of the Three Little Pigs. London: Puffin. Sipe. L, S., Picture Books as Aesthetic Objects, Vol. 6, No. 1, pp. 24. This entry was posted in Lawrence R. Sipe.